Harry Potter is a story. Really, when you stop and think about it, they are all stories. None of the authors attempt to put their books at the same level as scripture. None of them are attempting to undermine, change, or discredit the Bible. They are simply doing what authors do best. They are attempting to write a story. At this current moment I am in the process of finishing up a book. It is a fantasy-adventure book. While I may be a Reverend, the book itself is not going to be explicitly Christian by any means. Will the characters have to deal with a sense of right and wrong that I believe line up with the same morals of the Bible? Sure. But most of the governing laws of America do that as well. Is Harry Potter destructive to some people? Of course it is. Are violent video games destructive to some people? Of course they are. However, I think that how a parent raises their child is far more important than what they might read in a book or play in a game. Parents have the ability to help their children understand that a book is just a story. While there may be parallels and things that read like a Bible story, there is no replacement for the Bible. This should be the primary understanding when reading any type of literature that is not the scriptures themselves. As a matter of fact, this is the very same way that you should listen to a sermon. Does the sermon line up with what the Bible says? If it does not, this is more destructive than a book about a boy going to magic school could ever be. It is at this point that I recall another passage of Scripture that I think should bring some rest to parents who are unsure if they should allow their children to enjoy Harry Potter. This passage is Romans 14. Here Paul talks about a person who is okay with eating meat and another who is not okay with it. Paul himself says that there is nothing wrong with eating meat; however, the meat lovers should not be trying to force it down another person’s throat. It is not a sin for a person to abstain from meat. Therefore, Paul says it is a sin to tell them that they are wrong for doing so. This applies to more than just food and I think it applies to what we choose to entertain ourselves with. Another chapter would be 1 Corinthians 10 where Paul talks about how all things are permissible, but not everything is beneficial. It all comes down to a person’s heart. Is their heart right with God? Are they doing all they can to help others follow after God as well? If you can answer these questions appropriately, then feel free to read about the wizarding world of Harry Potter without guilt. I discovered the problem during this scene. The problem with Harry Potter is one that I recently realized while I was watching The Chamber of Secrets. At this point I have seen all the movies multiple times and have read the first book (yes, yes I know, I should read the books). I have also done a lot of research in order to fill in some plot holes that are most likely answered in the books. I also know, thanks to Pottermore, that I would belong to Hufflepuff House (P.S. Rowling Favors Hufflepuffs). As such, I have become familiar with a lot of things in the world of Harry Potter. This became most obvious to me in the scene where the students first have a class lead by Gilderoy Lockhart. If you are unfamiliar with the scene, watch it quickly below. As you can see, it is a scene that quickly gets out of hand and the students are left to fend for themselves as the useless Lockhart flees the scene. Now, in case you didn’t know, the students here are only in their second year. They were too young to really know the necessary spells. Even Hermione takes a while to conjure up a good one. They find themselves quickly overwhelmed and resort to trying to beat the pixies with books. I felt that I could have handled the situation better than the students because I have seen the movies multiple times. This is exactly what I found myself doing the last time I watched this scene. The students are first told to “round them up.” There are a couple of different spells that could be used for this. Stupefy, for example came to my mind. This would have stunned a couple of the beasts. With enough of the students working together, this would have cleared up the mess quickly enough. Then, as the scene gets more out of hand, I thought of another spell that would work. Petrificus Totalus. The students (at least Harry, Ron, and Neville) should have actually known this spell as Hermione used it in the previous movie. This essentially petrifies an enemy and would have allowed the student to put the pixies back into their cage. As Neville gets lifted off the ground by his ears and stuck on a chandelier, I heard myself thinking Wingardium Leviosa. This allows an object to hover and be manipulated. It might even have worked against the pixies and they could have put them into their cages and got poor Neville down as well. Eventually, Hermione must clear her head enough to think of the spell Immobulus. The scene ends here. I am not a Harry Potter guru. However, if someone like me could quickly think of which spells to use during the situation, then there are surely plenty of other people who could do the same. Maybe some of you have done this before. You have thought of which spells from Harry Potter would work in whatever situation you are experiencing, or you have quoted along with the movie, or you tried to help the characters in the movie by giving them the spell to use. At any rate, you knew which spell to use because you had memorized the spells beforehand. 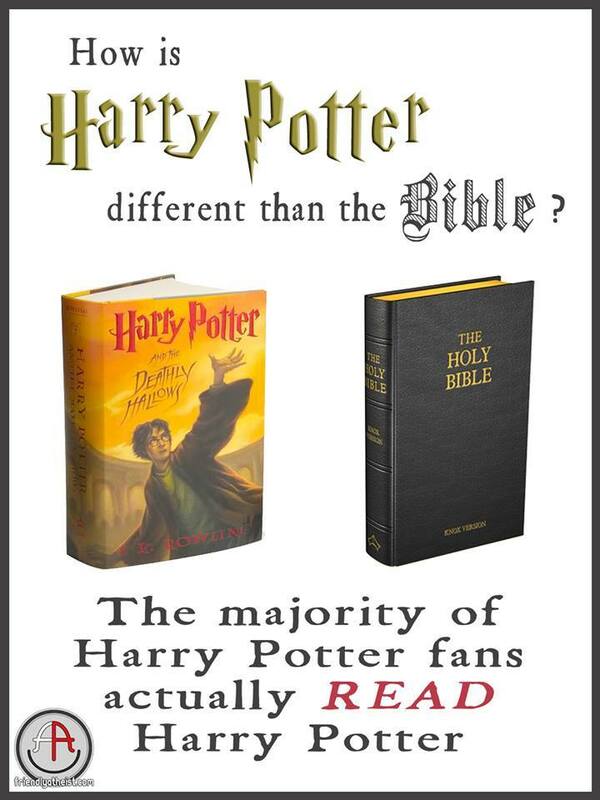 Continue on to the last page to see what the actual problem is with Harry Potter and Christians.